Whoever thought small-town retirement could be this dangerous? Retired dentist Paul Osborne hasn't fly-fished since his wife died. He hasn't had a woman tell him what to do since then either. But in the company of Lewellyn Ferris, he's relearning both. And when he and his lady instructor find a well-dressed body floating in the moonlight, Paul adds "deputy" to his list of experiences...Whether the death is accidental—or accidentally on purpose—Lewellyn is determined to reel in the truth. 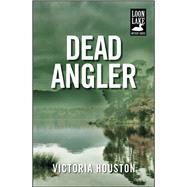 She enlists Paul and his walleye-expert buddy, Ray, to help her get to the bottom of the murky mystery.